Part one of a three-part graphic novel prequel series delving into the origins of the Skeksis, Mystics, Gelflings, the world of Thra and the Dark Crystal itself. 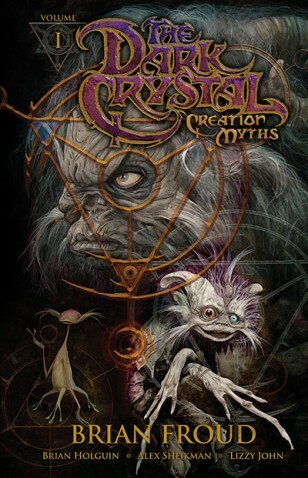 Spanning a time period from thousands of years ago to right up to the start of the original film, this graphic novel epic will tell the definitive origin of Dark Crystal, under the supervision of The Jim Henson Company and The Dark Crystal concept designer Brian Froud. 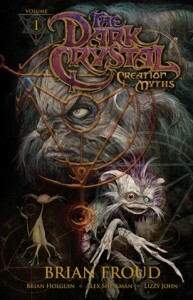 Anyone who remembers the awesomeness of Jim Henson’s “The Dark Crystal” will want to give this series of graphic novels a look. Here we have the previously untold histories of Thra, the world brought to life in spectacular fashion by Jim Henson and his band of merry misfits. Sure, watched now, with jaded eyes used to seeing everything in CGI, Henson’s creative masterpiece might not hold up. But I have to say that very few movies of the time will stand out in my memory as completely unique. The Dark Crystal was, hands down, without a doubt, one of those movies. Volume one in the series gives us several stories that highlight some of the memorable characters and races shown in the movie. The birth of the all seeing, all knowing Aughra. The tale of how the Gelfling girl got her wings. The arrival of the mysterious Urskek, beings of light and power. Sure, maybe you never gave any of these background stories a second thought. Maybe you never cared about Gelflings girls or their wings. Maybe you have no idea who this Aughra person even is. But if you hold Jim Henson’s creative genius in any level of regard, this might be something up the proverbial alley. Held up as a creative classic, or overlooked as an outdated experiment, The Dark Crystal has outlasted many other movies of its time. Here’s just a peek behind the curtain to give a little insight as to why that might be.